The Online National Residential Estate Agency are the estate agents that deliver the Best Prices, Quickest Sales and Fastest Completions for both corporate and private clients. Established in 2007, we have bought and sold 1000’s of properties throughout London and the UK. We provide an unbeatable service for sellers because, unlike your average online estate agents, we both buy and sell properties – fast! There’s one thing that our seller clients have in common, and that is they are looking a quick, certain sale for a property, and for the best price possible. The average estate agent cannot provide this service. At National Residential we are able to help clients achieve quick sales in the time scales they require by either buying their property quickly for cash through our ‘7 Day House Purchase Fund‘ or by helping them sell for 100% market value in 28 days to chain-free and financially qualified buyers assuring a fast and certain completion. 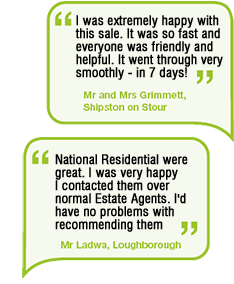 Simply decide if you want to SELL YOUR PROPERTY in the FASTEST TIME or for the BEST PRICE. Our sellers are motivated to achieve a quick and certain sale and so buyers have the opportunity to purchase the property they want at discounted prices. 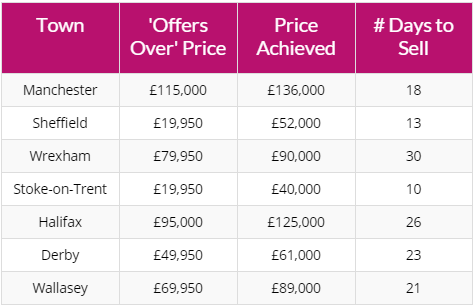 Furthermore, our properties are taken off market exclusively for successful buyers, ensuring buyers will not be gazumped and will not lose money on wasted fees. We use the very latest technology to enable buyers to monitor and make their offers online 24 hours a day from their PCs, tablets and mobile smartphones. We ensure that buyers get a fantastic service and have the best possible opportunity to buy the property they want at a discounted price, quickly. National Residential are registered with the Property Ombudsman and we ensure that we keep all our practices in line with industry-standard Code of Practice. We put our customers first and ensure our valuations and processes are transparent, so you know you are dealing with a company you can trust.